Many candidates get rejected for using resume templates that are unreadable by applicant tracking systems (ATS) and resume screening software. Ensure you never get rejected by a computer again. Our professional Word and Google docs resume templates are vetted by recruiters and are optimized to pass ATS and recruitment software. If you've graduated a few years ago and already have some work experience, you should use a resume template that prioritizes your work experience by listing it first. This is what recruiters will be focusing their attention at. 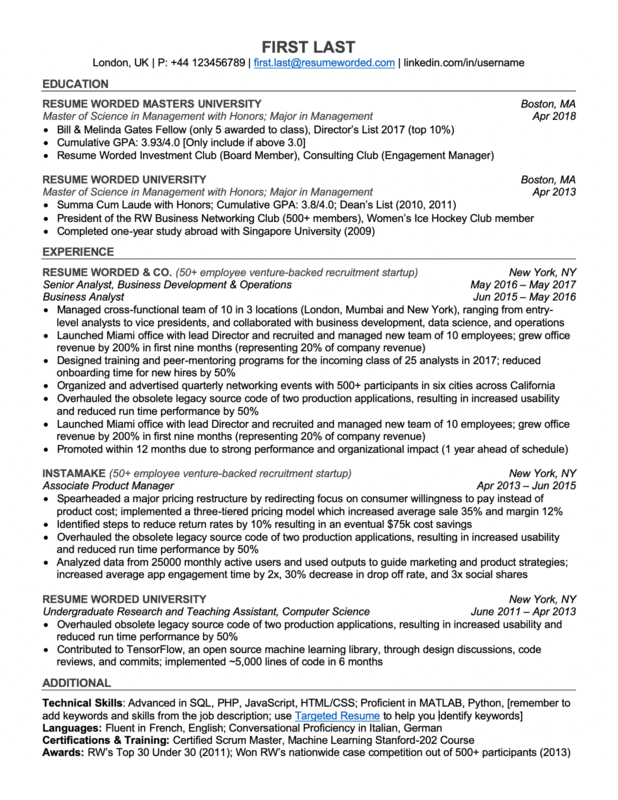 Use a simple, professional resume template like the ones below. They are all compatible with ATS and come in either Word templates or a Google Docs link. Free ATS-compatible resume templates that are suitable for experienced hires. Available in Word and Google Docs. 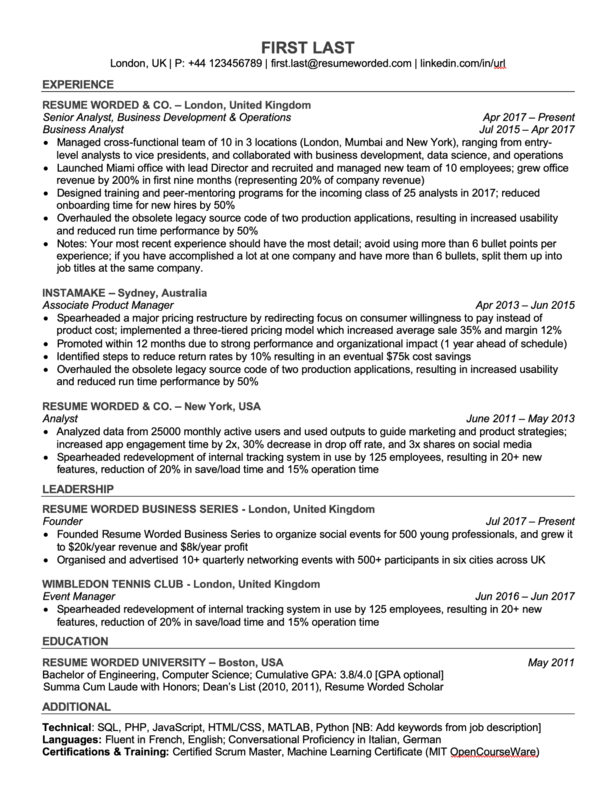 This professional resume/CV template is suitable for all industries, including Finance and Technology. Its simplicity makes it perfect for ATS, and it's free. It also has a 'Leadership'/'Projects'/'Activities' section, for highlighting experiences outside work. 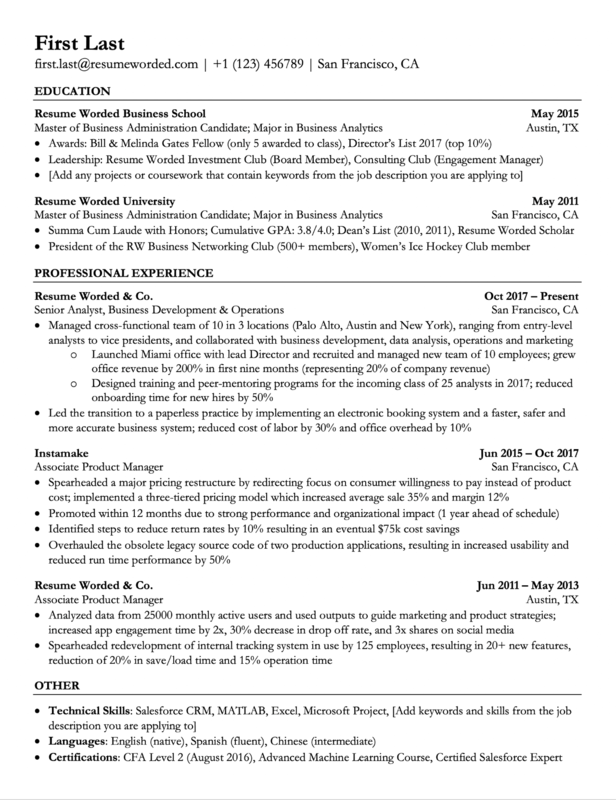 This resume template is suitable for experienced hires, college graduates and students, or even high school students. You can easily download this template in Word doc or Google docs, and just fill in the required details. As all the templates are, it's compatible with ATS. 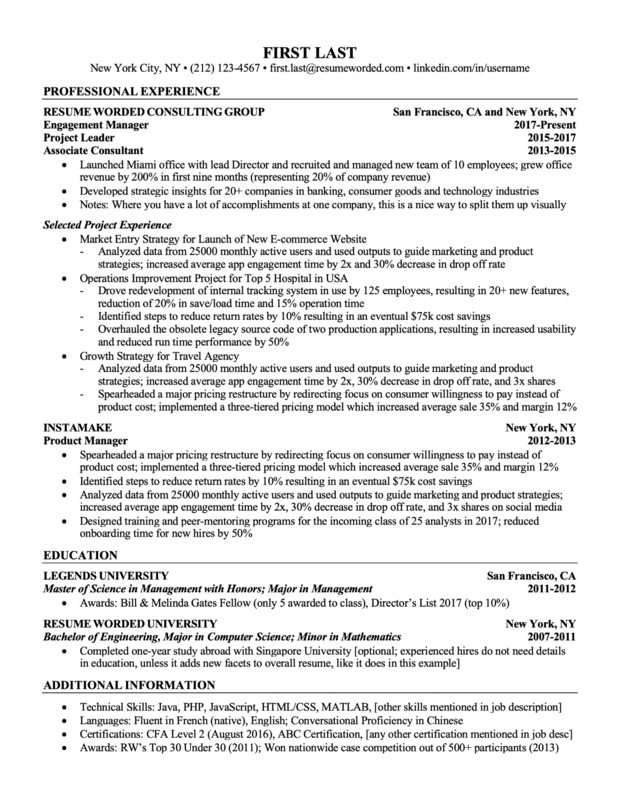 This professional resume template is perfectly formatted and is great for distinguishing between multiple projects you've worked on at the same company, plus across multiple roles you've held. Note how the education section is concise and only lists key details. If you need to give an overview of your responsibilities, you can use short introductory paragraphs before your bullet points, to add context to your achievements like in this template. This is useful if your company name or role title is unknown to your target employer. Updated for 2019, this resume template is effective if you want to prioritise your work experience and distinguishing between multiple roles at the same company. This template is available for download in Microsoft Word format or as a Google Drive link. Here's a clean, professional template that shows you how to list multiple projects. Suitable for freelancers and any job that requires multiple engagements. Available in Word and Google Docs, and you can also copy and paste this template into Pages or LibreOffice. 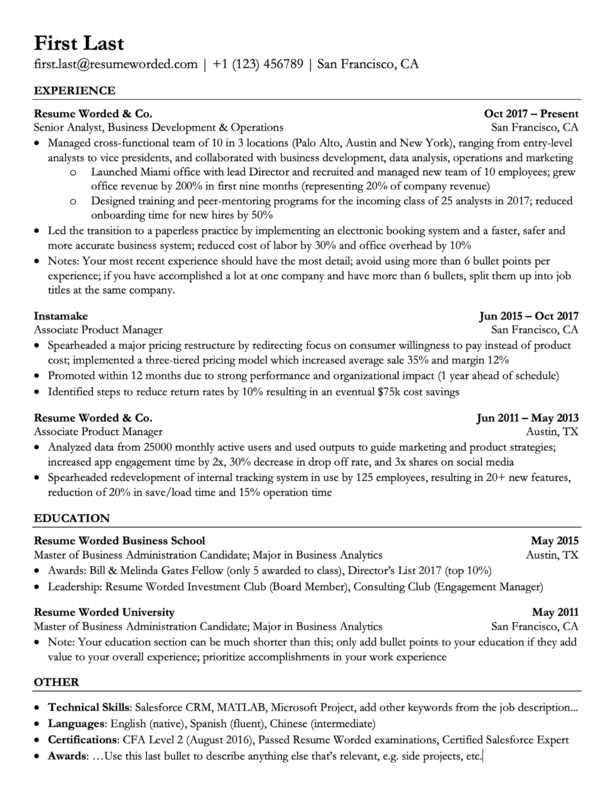 If you've recently graduated from college, masters or an MBA school, it's a good idea to use a resume template which prioritizes your education by listing it first. 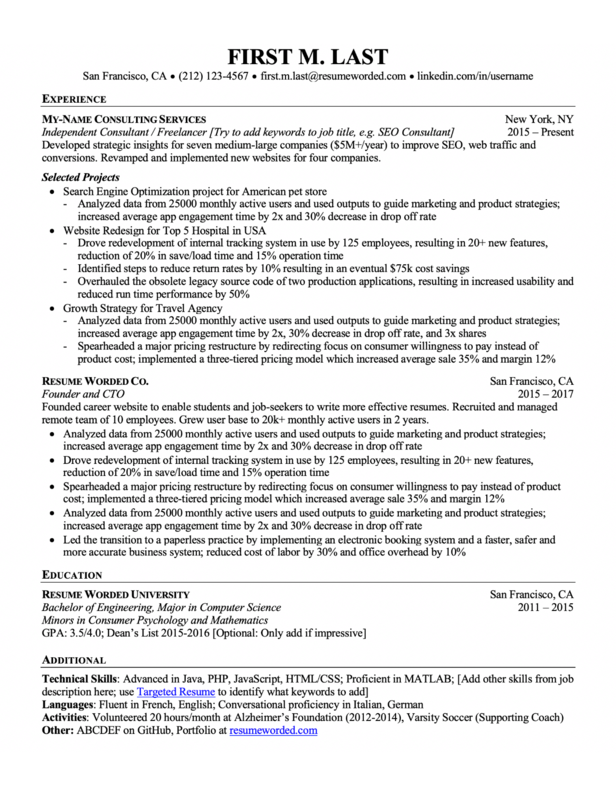 The following templates are professionally designed by recruiters, and are available in Word (.doc) format and as a Google Drive link. This downloadable template is suitable for all industries and phases, such as entry-level or more senior. 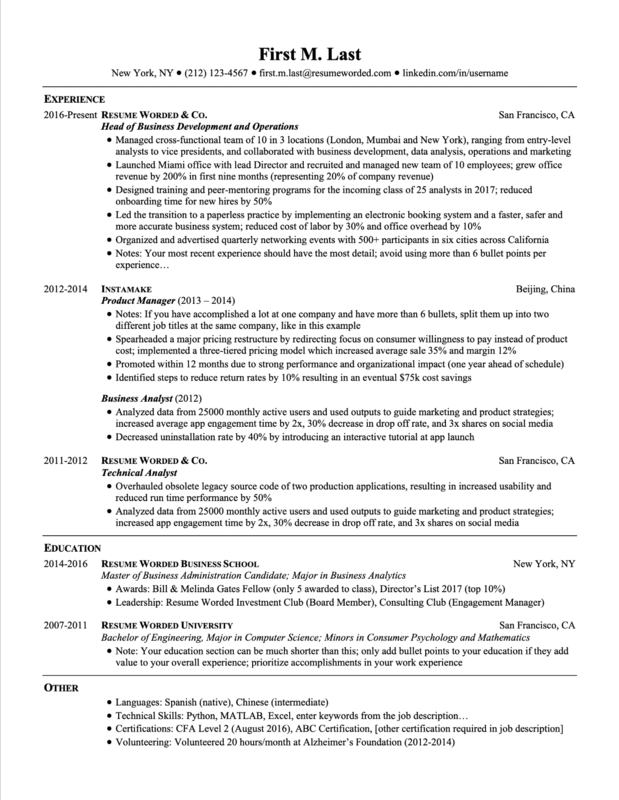 It's a simple, professional template and is a common format across top resumes from college graduates and entry-level jobseekers. Here's a good ATS-friendly template that does an effective job at showcasing recent education, as well as distinguishing between multiple roles you've had at the same company. It's downloadable in Word doc format or editable directly via Google Docs. This ATS-compatible template is perfect for recent graduates who have some experience under their belt, say a couple of internships or summer jobs. 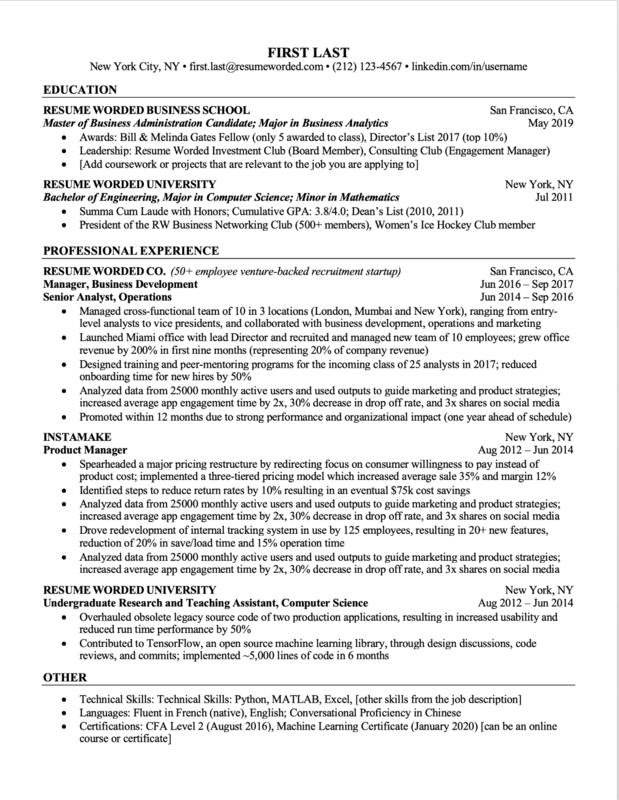 If you'd like to use this resume template, but don't have experience, add in another section titled 'Projects'. 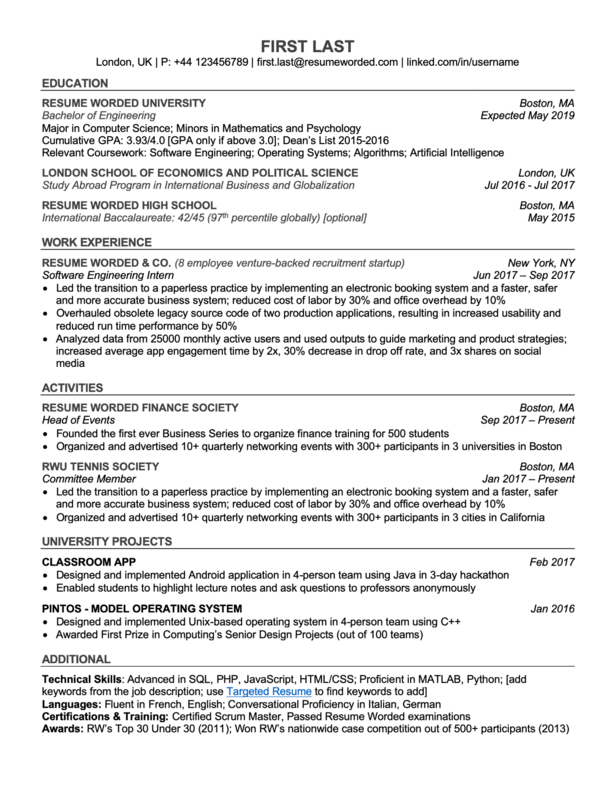 Similar to the other ATS templates in this category, this resume template highlights key accomplishments at university and demonstrates how to list your work experiences. You can also create a new resume section (e.g. Leadership) and add your extra-curriculars into it. If you're a high school student or a college student, don't have much work experience yet or looking for entry-level jobs, these student resume templates are perfect for you. They prioritise your education by listing it first, and show you how to list your university projects and extracurricular activities on your resume. 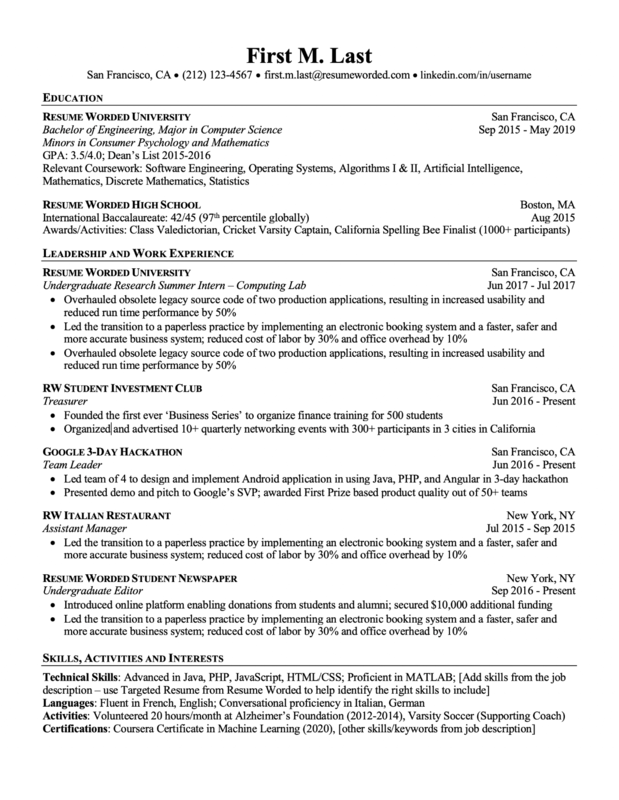 These resume templates are downloadable in Word (.doc) format or editable directly via Google Docs. Here how to show your study abroad if you're a college student. This ATS template highlights your college projects and extracurriculars, and is downloadable in Word doc format and editable in Google Docs. 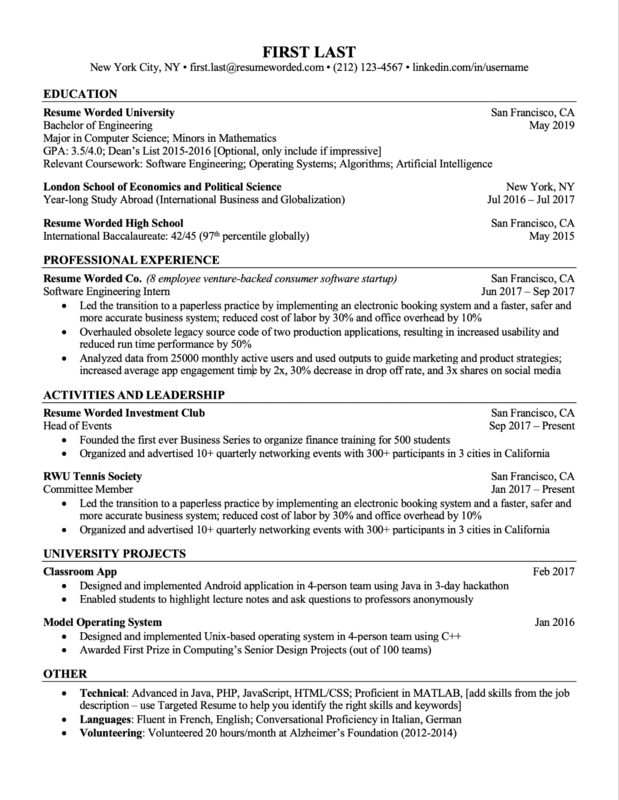 This is a professional resume template that students can use to showcase an internship, student activities/extra-curriculars and any relevant class projects. It's available for download in MS Word format or via Google Docs. 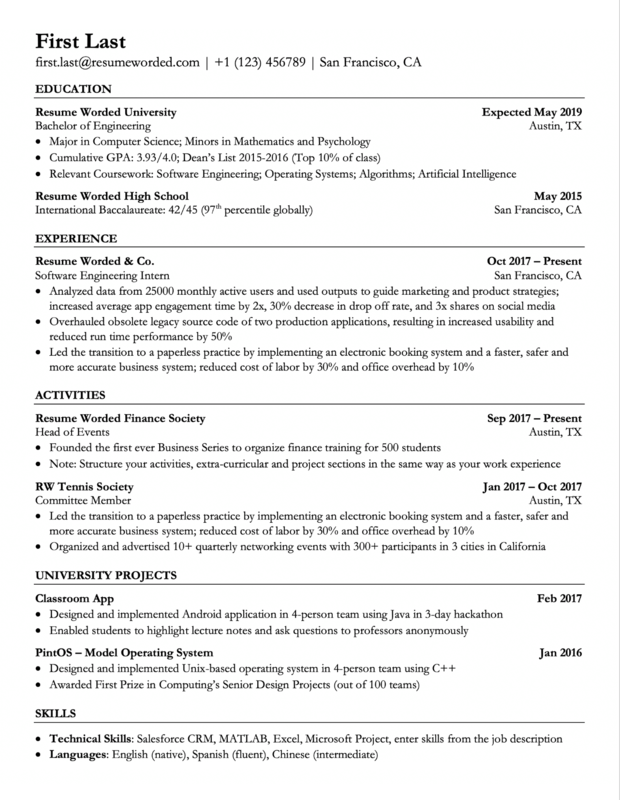 Use this resume template if you don't have much work experience yet and would like to elaborate on your extracurricular experiences and university projects that are relevant. This template has been tested with all ATS, including Taleo, Workable, and iCIMs. You can download this template which shows you how to spin your extracurricular experiences into achievements and put these under a combined section called 'Leadership and Work'. This is suitable for high school students or college students with little experience. Here are answers to frequently asked questions about ATS and resume templates. We'll continuously add to this section over time. What are ATS or resume screening software? And how can I make sure my resume will be properly processed by them? - No pictures, diagrams, etc. We have a checklist here, which summarizes most elements of what a good resume looks like. You can also use Score My Resume, which is a state of the art resume review tool. If your resume can be properly scanned by Score My Resume, then you can be confident that it will also be read by ATS software that companies use. 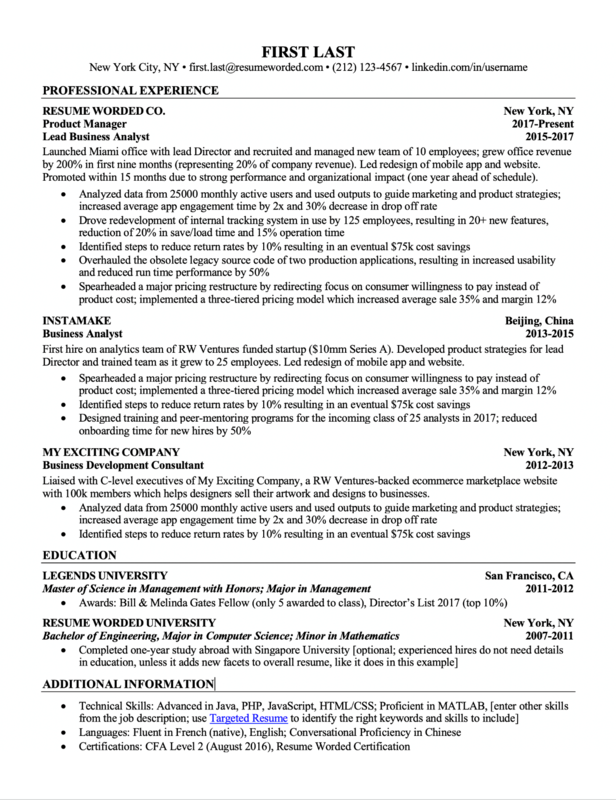 What do hiring managers at top companies think of these templates? The templates we've brought to you are vetted by recruiters and hiring managers at top companies, and follow all the right resume standards/advice. This includes no objective/summary sections, no images, no graphs, no fancy designs/colors, no tables, meet whitespace requirements and use the right margins/font sizes. They've been used by candidates to get into companies like Google, McKinsey, and Goldman Sachs, and we know these templates work. I want a more fancy template! What do I do? We strongly recommend using one of our standard templates we've provided to you above (unless maybe you are applying for an extremely creative role!). The main reason for this is that is that most companies use Applicant Tracking Systems (ATS), which are effectively resume screening software to process your resume. Most multi-column fancy/colourful templates are not properly parsed by these ATS systems, which hurts your chances significantly of getting an interview. This is why all the templates we've provided to you are rigorously passed through ATS systems to ensure they are read correctly. Can I add graphics to my resume? We advise against this. As a follow on to the above question, 'creative resumes' waste a ton of space, aren't bulleted in the right way, make it hard for recruiters to skim through, aren't readable by resume screening software, and are costing you interviews. © 2018 Resume Worded. All rights reserved. Get tailored feedback on how to generate 5x more jobs, leads and opportunities. E-mail Please enter a valid email address This email address hasn't been signed up yet, or it has already been signed up with Facebook or Google login. must contain at least 1 letter and 1 number. It looks like your password is incorrect. E-mail Please enter a valid email address This email address has already been taken, or you've already signed up via Google or Facebook login. We currently are experiencing a very high server load so Email signup is currently disabled for the next 24 hours. Please sign up with Google or Facebook to continue! We apologize for the inconvenience! must contain at least 1 letter and 1 number. Lost your password? Please enter the email address you used when you signed up. We'll send you a link to create a new password. E-mail This email address either hasn't been signed up yet, or you signed up with Facebook or Google. This email address doesn't look valid. Access the full report, including Line-by-Line Analysis. Unlimited uploads. 300+ curated resume bullet points that got people hired at top companies. Write your resume in half the time with twice the impact. 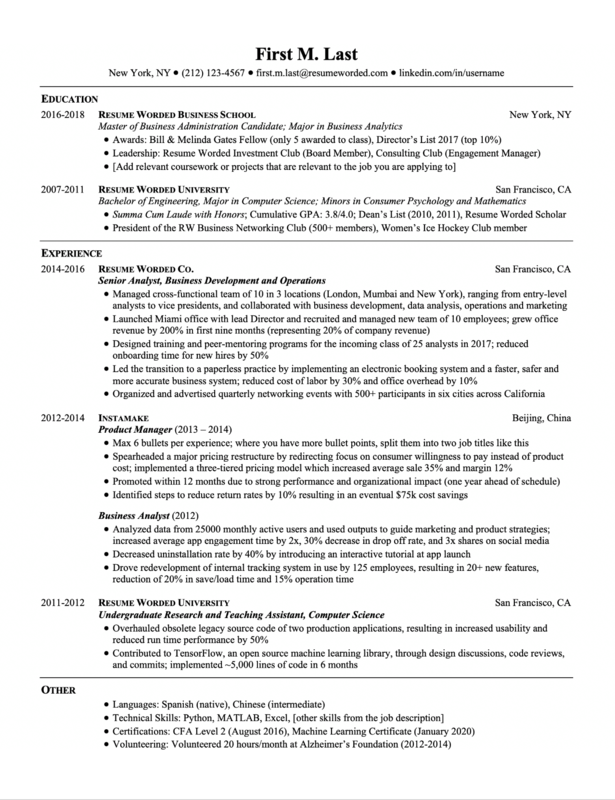 Resume templates that are designed to pass automated resume screeners and ATS. Learn how recruiters think. Write your most successful resume and get more interviews. Get found by the right people and generate 5x more jobs, leads and opportunities. Best value (33% off). Billed every 3 months. Cancel anytime. Secure payment by Paddle. Cancel anytime. Are you a career coach? Empower your clients and get a bulk pricing discount.